Mass. Senate repeals “1913 Law” to allow out-of-state gays to “marry” in MA using voice vote. Members too cowardly to go on record. Complete cave-in to homosexual lobby by elected body. In a frighteningly unified move, the Massachusetts Senate caved in to the homosexual lobby today as it passed the repeal of the “1913 Law”. Showing a grotesque display of cowardice, they used a quick, inaudible voice vote -- instead of the normal and expected roll-call vote -- in order to avoid going on record. Watch for yourself the entire "debate" and "vote"
It had to be seen to be believed . Not a single member of the 40-member Senate made a motion for a roll-call vote – or even protested the action. In fact, none of them even spoke against the bill during the debate period, although several spoke for it. It was worse than shameful. The cherished concepts of a representative democracy were nowhere to be seen or heard. It also shows how completely out of touch with reality our politicians are. This is not trivial. Repealing the “1913 law” essentially destabilizes marriage laws both in Massachusetts and around the county. The current law prohibits out-of-state couples from marrying in Massachusetts if that marriage would be illegal in their home state. Repealing it has been a top priority of the homosexual lobby in order to purposefuly spread legal havoc in other states over homosexual "marriage". (Here’s the language of the repeal bill – S800.) As we’ve reported, national gay groups have poured in money for this, and they’ve hired “the best lobbyists in the State House” to get it done. It certainly worked today. Everything involving the debate and vote appeared to have been choreographed by the homosexual lobby. In all our years of pro-family activism, we have never seen a legislative body so spectacularly dominated by the will of a small special-interest group. Our Senators were well informed about how the public opposes this. We know for a fact that thousands of emails and faxes were sent to the Senator’s offices. And hundreds more phone calls were made to them. But every one of them chose to ignore that. The homosexual lobby was masterful the way they played the Massachusetts Senate like a violin. As described above, the homosexual lobby MassEquality bragged in their emails to supporters that they got a “matching $25,000 grant” from a wealthy national homosexual group, and that they’ve hired “the best lobbyists in the State House.” And the Boston media, as usual, acted as their unpaid propagandists. 1. 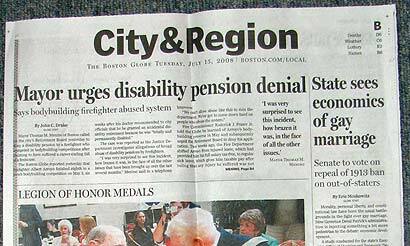 Early morning: Planted in Tuesday’s Boston Globe -- pro-gay article and major editorial. On the morning of the vote, the ultra-biased Boston Globe just happened to feature a “breaking news” story about a just-released “study” by pro-gay Gov. Deval Patrick’s administration claiming that $116 million will come into Massachusetts from all the homosexuals that will flock here to “marry.” All we need to do is repeal the 1913 law. And on the Globe editorial page, which repeated the “interracial marriage” claim. Another reason no one should take the Boston Globe seriously. 2. Late morning: More threats and scare tactics. Homosexual activists put last-minute pressure on Senators. The first is that the 1913 law was “rooted in racial bigotry” and therefore anyone who doesn’t agree with the homosexual lobby will be labeled an anti-black bigot. Is that true? There’s absolutely no proof of that. It’s scare tactic by the homosexual lobby. It certainly has nothing to do with the common-sense application of the law today. The genesis of the law remains murky. It was approved at a time when many states barred interracial marriages, although supporters say there's no evidence it was racially motivated in Massachusetts, which began allowing interracial marriages in 1843. There's no record of the legislative debate on the bill, which raced through the Massachusetts Legislature in three weeks and was quickly signed into law. It appeared to come out of a nationwide effort to eliminate conflicts among the country's patchwork of laws. But it also came during a time of racial tension, including a scandal over black heavyweight boxer Jack Johnson's marriage to Lucille Cameron, who was white. The law was rarely enforced until Massachusetts' Supreme Judicial Court ruled in 2003 that the state could no longer bar gay couples from marrying. The second intimidation tactic was that there will be a major economic windfall to the state from hordes of homosexuals coming here as tourists to "marry." And thus, being against this means you're against economic prosperity! Of course, that's all just speculation from a biased government source. But even if it were true, why should we subvert our marriage laws for money? Using that logic, maybe we should sell heroin in stores here. That would bring in money. And just what we all want is thousands of homosexual tourists throughout Massachusetts. An incentive for regular tourists to go somewhere else. Nor was anyone hearing anything about the health issues, STDs, and other social and economic costs associated with an influx of homosexual behavior. 3. 1:00 p.m. Senate Democratic caucus before the session. Although the session was scheduled to begin at 1 pm, the Democrats – 35 of the 40 members – held a closed-door caucus that lasted over an hour. In the caucus, the pro-gay Senate leadership apparently threatened everyone even more. Outside in the hall, homosexual lobbyists were confidently telling reporters that “the votes are already counted” and they were going to win this. Printed copies of the homosexual lobby’s talking points were given to members of the press. Waiting to start: Homosexual activists, left-wing supporters, and others gather outside the Senate chambers while the Senate Democrats caucus. 4. The Senate session begins – perfectly choreographed. The members marched into the Senate chambers and got started. Five Senators spoke for the action – none spoke against it. It basically followed the gay lobby’s talking points. Republican RINO Sen. Richard Tisei (R-Wakefield) said he supports repealing the 1913 law, but would like to hear the main supporter of the bill (Sen. Wilkerson) to explain the benefits of repealing it today. Then, right on cue, Sen. Diane Wilkerson (D-Boston) stood up and read a long, rambling diatribe about why this law must be repealed, and how racist it would be not to do. A quick-and-dirty vote. At that point no one else rose to speak, so the Senate President quickly blurted out “All in favor say ‘aye’ opposed ‘no’. The bill passes.” There were no actual audible “aye's” or “no's”, just a sort of general murmur. And that was it. The Senators immediately went on to their next order of business and most of the spectators left the galleries. But many of us just stood there looking at each other in disbelief. 5. After the vote – feeding the press. 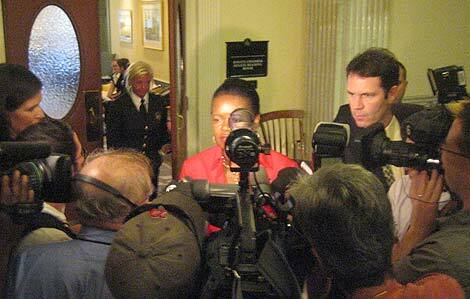 Immediately afterwards the Boston media and homosexual activists converged outside of the Senate chambers. Like everything else, this was obviously well-planned by the homosexual lobby, and the press was quite willing to play along. Although some of the press went though the motions of interviewing pro-family representatives (including MassResistance) they were clearly more interested in helping celebrate the homosexuals’ victory. You’ll see by watching the video below. 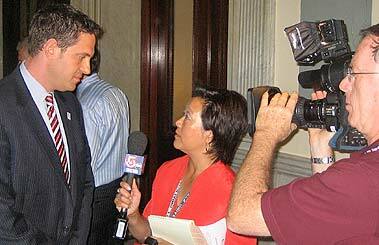 After the vote, Channel 5 TV rushed to interview homosexual lobbyist. TV cameras and reporters converged around Sen. Diane Wilkerson, the homosexual lobby's "point person" in the Senate who harangued everyone. 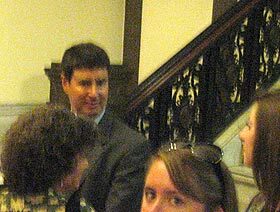 Ultra pro-gay Senator Robert Antonioni (D-Leominster) came out to meet and greet. Lesbian lobbyist Arline Isaacson (right) stands on stairs to oversee the press coverage outside the Senate chambers after the vote. The Boston media played their part well, starting with the evening TV reports. The Channel 4 clip below is an example of the incredibly slanted "news" coverage. Notice that the homosexual lobby is showered with praise and positive spin, while the pro-family side (including Brian Camenker of MassResistance) get a few quick seconds. In the actual interview we had addressed the racism fraud regarding that bill, the economic issues, and a lot more. But none of that made it to the final cut. 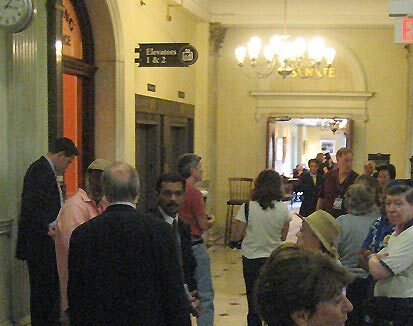 We were disappointed with two “pro-family” Senators – Scott Brown and Robert Hedlund. (We use the term “pro-family” here in a relative, not absolute sense, unfortunately.) They caved in with everyone else. Not a peep out of them. Brown will be looking for support this fall from people against a lesbian activist challenger. We’ll see what happens. Hedlund has been doing stints as a WRKO-Radio talk show host. Maybe he enjoys hanging around the media crowd a little too much.